Husband and wife duo Adam and Sofia Zimmerman launch their Brooklyn furniture design studio Ot/tra with a sleek line, the Catenary Collection. Sofia and Adam Zimmerman with the Catenary Collection chair, side tables and bar stool. Photo by Michelle Guanca. Adam and Sofia Zimmerman met in 2007 when he was working as an architect at Kohn Pedersen Fox and she was an editor at a design trade magazine. Sofia was looking for a roommate for a great apartment she found, and Adam was new to the city and needed a place to live. However, after meeting for coffee, Sofia rescinded her offer on the apartment, deciding the two should date instead. The couple was engaged exactly one year later, married the following year and shortly after their wedding they started planning their boutique architecture firm Zimmerman Workshop, established in 2010 in Brooklyn. “We balanced out each other’s skills,” Sofia says of the collaboration. “We had one project lined up. It was in the middle of the recession. We would sink or we would swim, and we had little to lose, so why not?” A decade later, in addition to a flourishing architecture business, they launched their furniture design company Ot/tra, at the 2017 Architectural Digest Design Show in March. What inspired the duo to branch out to designing furniture? 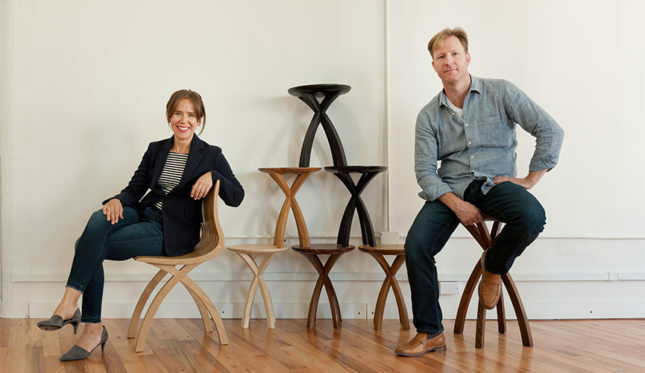 Sofia and Adam talk with Worth about the inspiration behind the sleek, high-end Catenary Collection, the challenges of the new endeavor and the story behind the name of their studio. Adam and Sofia Zimmerman seated at the conference table in their studio that sparked the Catenary Collection. Photo by Michelle Guanca. Why did you start designing your own furniture? Adam: It was actually a side project that led us to where we are now. We had designed a detail—a series of catenary curves—for the base of an island for a friend’s home in Stamford, Conn. A couple of years later, we thought it would be fun to adapt that to a conference table that we needed for our office. We worked with a local woodworker and once the table was installed, we were done. But after a number of compliments and inquiries [about that piece], we decided to start another company just for the furniture. What was the aesthetic inspiration behind the line? Sofia: We were inspired by George Nelson’s Platform Bench and the St. Louis Gateway Arch by Eero Saarinen. Both are so timely, but also timeless and still relevant. The other thing is not so much an inspiration as it is an objective: We aim to infuse everything we do with a softened contemporary aesthetic. There’s an elegance to it, but there’s nothing precious going on. It’s livable. How many pieces are in this debut line? Sofia: We launched with nine pieces: a table, two coffee tables as well as end tables, a bench, a chair, a lounge and two barstools. In hindsight, that was pretty ambitious, but if you knew Adam, you’d know he goes all out when he gets excited about something. 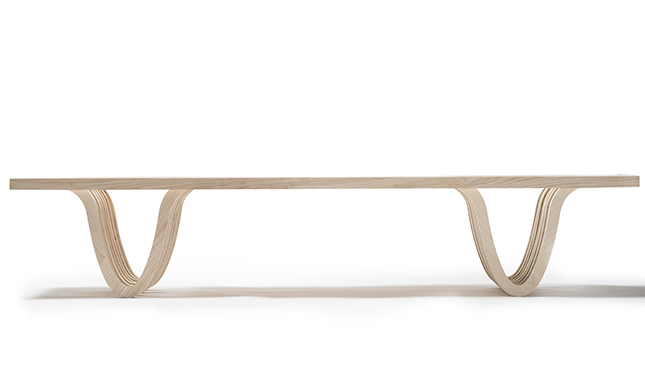 Catenary Collection table in walnut by Ot/tra. Photo by Kronus Studio. 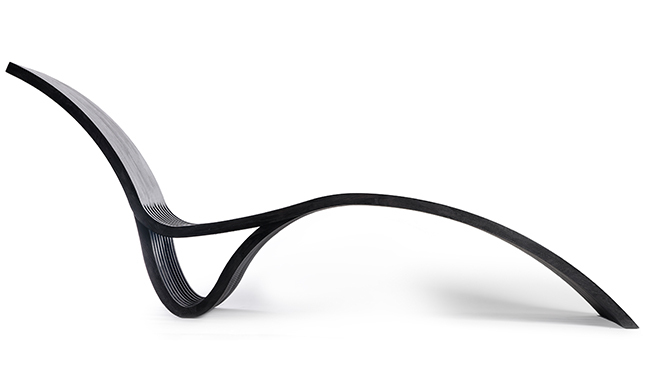 Catenary Collection lounge chair by Ot/tra. Photo by Kronus Studio. 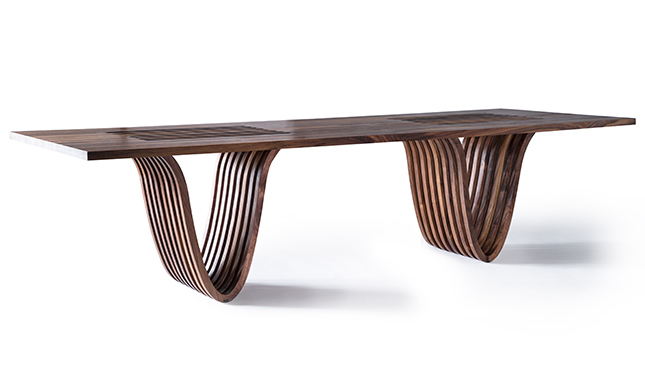 Catenary Collection bench by Ot/tra. Photo by Kronus Studio. 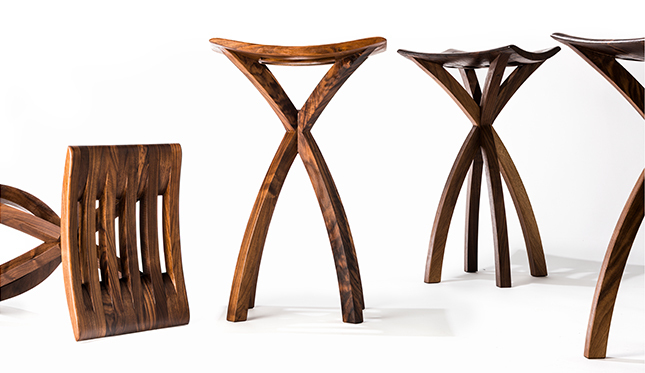 Catenary Collection bar stools by Ot/tra. Photo by Kronus Studio. 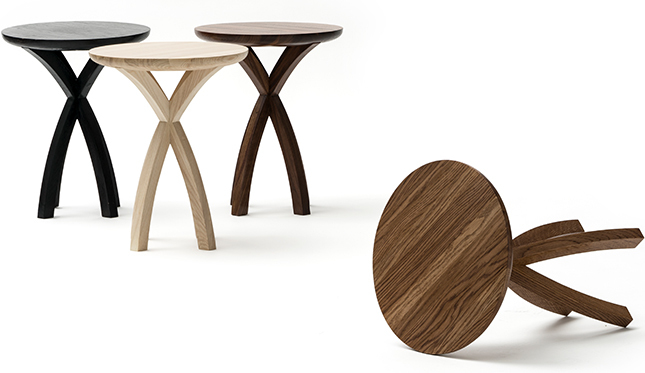 Catenary Collection side tables by Ot/tra. Photo by Kronus Studio. 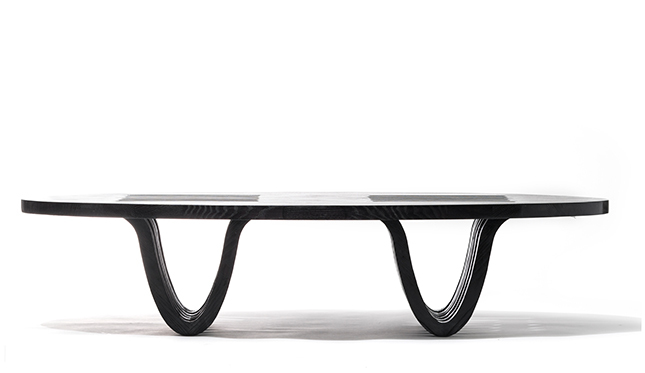 Catenary Collection elliptical coffee table by Ot/tra. Photo by Kronus Studio. 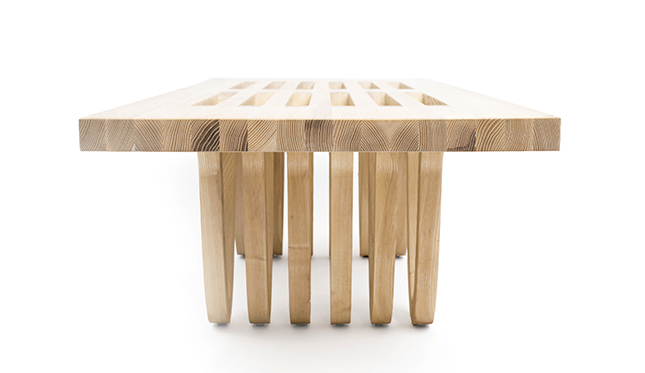 Catenary Collection coffee table by Ot/tra. Photo by Kronus Studio. In what types of settings do you see this Catenary Collection being most appropriate? Adam: We see most interest from residential and hospitality designers, but really, it’s a line that works wherever there’s a desire for something that’s functional and sculptural. Sofia: Like a pair of fantastic jeans, you can dress it up or down, go crazy or keep things simple. It’s easy but elegant in a family home, can add warmth and balance to a corporate setting or just be a statement on its own. I would love to see our table in a big hotel lobby, set in place under some well-positioned lighting to really play up the shadows. How did you decide that you would handcraft the furniture pieces in Brooklyn? Adam: We didn’t intend to build the furniture ourselves. We initially worked on some prototypes with an independent woodworker upstate, but when it came to doing the barstool, we ran into some problems because the design is pretty complicated. We did a lot of calling around and couldn’t find anyone to make it. But at the same time, we were moving offices and had just hired an architect that basically grew up in a woodshop. He helped us figure out what equipment we needed to get started, and we converted our old office into the shop. Then came the several grueling months when we began to understand why nobody wanted to do the barstool. We figured it out eventually. A little naïve optimism certainly played a role in underestimating what we were getting ourselves into, but we’re glad we realized how difficult it would be only after it was too late to turn back. What’s been the biggest challenge of this new endeavor? Adam: Zimmerman Workshop provides a service, and Ot/tra is a product. We had gotten to a point with Zimmerman Workshop where we didn’t feel like kids anymore—things were more established. Launching Ot/tra put us back in startup mode. But we’re trying to have fun with that part. It’s not often you get to launch another business, right? Sofia: I sometimes joke that Ot/tra has been like having another baby. Like parenting the second-time around, we had figured out the basics to make things easier. Our Rolodex is full of resources, we can navigate through tedious government paperwork, and Adam and I have learned to lead and manage people. That’s another thing we have now that we didn’t before: a talented, hard-working team. When do you think you’ll release more pieces? Adam: We want to get to a point where we’re introducing a new line once a year, but only if we really feel the idea is right. We’d rather go for quality design over quantity. For now, we’re staying focused on building our brand and enhancing our current collection. One of the things we just previewed was a console table. We’ve also designed a new asymmetric base that works especially well for shorter pieces, and we’re offering a marine-grade finish so the furniture can be used outside. And we’re always tinkering. There are a few more ideas waiting to be prototyped. Tell us about the name of the company. Adam: Our son is named Otto and our daughter is Petra, so we found a way to combine the two. As parents of young children, pretty much everything we do is for them anyway, so why not name the company after them too?